Not only is the U.S. employment situation improving, but it is doing so in the right way. The official U.S. unemployment rate has dropped by more than 1 percentage point over the past year, according to the latest government data. While this is definitely good news, a more accurate measurement of the United States' employment situation is a lesser-known metric called the U-6 unemployment rate. What is the U-6 rate? The unemployment rate we normally see in news headlines is officially known as the U-3 unemployment rate, which includes people ages 16 and over without work who are actively seeking full-time employment. The U-6 unemployment rate includes all people who meet the U-3 definition of unemployed, but also counts two other groups: those workers who want a full-time job, but can only find part-time work; and "marginally attached workers" who are discouraged and have stopped looking for work, even though they want a full-time job. Naturally, we would expect the U-6 rate to be higher, since it includes more people. However, since the recession, the gap between the two measurements has been very wide. In other words, the number of people who have given up or have had to settle for part-time work has been quite high. Before the recession hit, the gap between the two rates was steadily between 3% and 4%. However, since the recession, alongside a falling official (U-3) unemployment rate, the gap widened to between 6% and 7%. While there is still progress to be made, in the past few months the gap between the U-6 and the official unemployment rates dropped to less than 6% for the first time since the recession. The smaller the gap between the official unemployment rate and the U-6 rate, the more accurate a picture the official rate provides. In other words, if the official unemployment rate drops to just 5%, but 10% of the population is underemployed or has given up, the actual employment situation in the U.S. is not as good as we are led to believe. 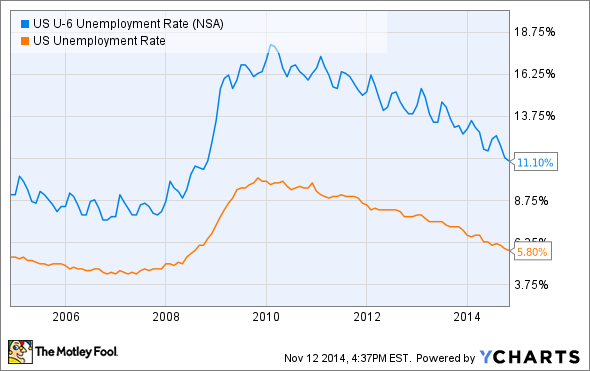 Where should the U-6 unemployment rate be? The narrowing gap between the two unemployment rates is indicative of two positive developments for the U.S. economy. First, it means more people are able to find full-time work. Not only does this mean more people will have a likely higher salary to live on, but more people will qualify for health insurance, retirement plans, and other benefits. Second, it could mean people who had become so discouraged that they stopped looking for jobs are finally beginning to return to the workforce. Both of these are promising developments that we'd like to see continue. And while the gap will never go away completely -- some people will always struggle to find full-time work, and some will inevitably become discouraged in their job searches -- we still have a long way to go before it's at a "healthy" level. Returning to the pre-recession 3-4% gap between the official and U-6 unemployment rates would be an indicator of successful economic recovery. In the meantime, the progress made in the past few months is definitely an encouraging sign.